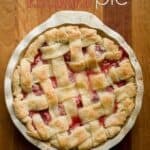 Strawberry Rhubarb Pie with a homemade all butter flaky crust is a mouthwatering, sweet, tart, dessert that everyone loves. During the early summer months, you should make this delicious fruit pie with fresh strawberries and rhubarb. But don't worry, frozen fruit works just fine when it's not in season. Lay one pie crust into your pie dish. Cut your other pie crust into strips that are about one inch wide for the lattice top. Whisk corn starch into 1/4 cup water until well blended. Combine with rhubarb and sugar and heat in medium sized pot over medium low heat until thickened, about 10 minutes. Combine with strawberries and allow to sit for 30 minutes. Add fruit mixture to pie shell. Dot with butter. Arrange dough strips into lattice pattern and tuck ends under. Beat egg yolk and brush onto top of crust. Sprinkle with sugar. Bake at 400 degrees F until golden and bubbly, about 35 minutes. Turn oven off and allow pie to remain in warm oven for 15 additional minutes. Remove from oven and cool on rack. Serve pie warm with a scoop of vanilla bean ice cream or enjoy it at room temperature with your morning coffee.